Like it or not, I am going to talk about naked muskrats again. Turn away and cover your eyes, ye avoiders of meat, because I will be showing blood. Cover your ears, ye traditional meat eaters for you shall hear of eating “rat.” Speak not, ye “Stream of consciousness” talkers, for what I am about to discuss rat meat and ask that the phrase “ewwwww” not dominate your vocabulary. 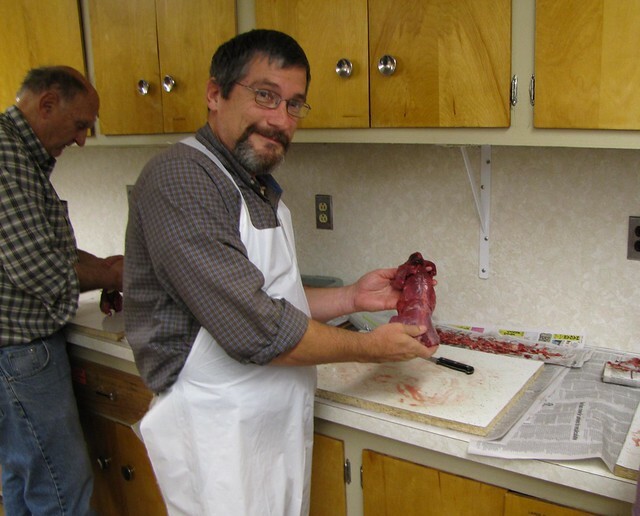 I am doing this because the day after Christmas was muskrat preparation day at the Monroe Boat Club and I was there to assist in the preparation and I (as you may know if you are a regular reader) cannot not talk about muskrats for any extended period of time. 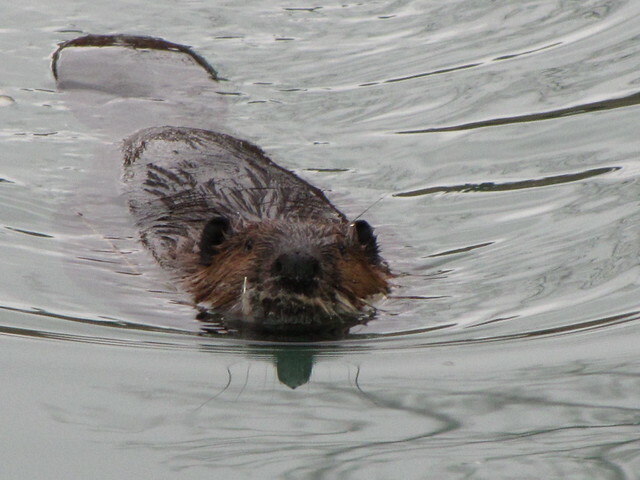 Some 200 muskrats awaited the cleaning crew at the Monroe Boat Club on that morning. 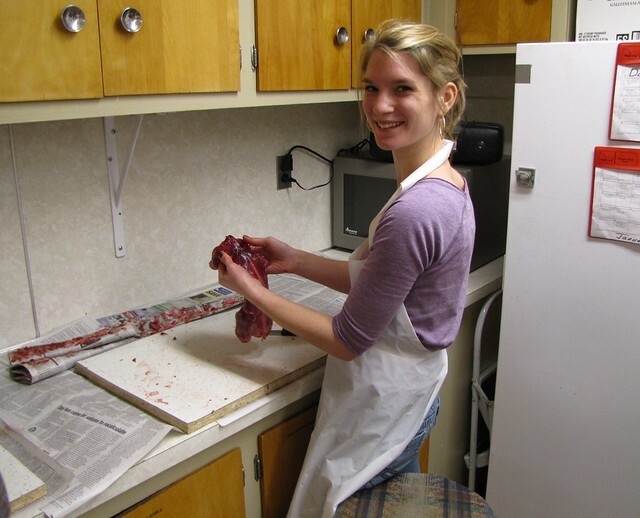 It has been a long tradition to clean the carcasses on Dec. 26th and to serve them at a muskrat dinner on the following week. I brought my son Jim and daughter Katelyn along to assist in the cleaning. The ‘rats in question came from a trapper in Napoleon, Ohio and were already “cleaned” by most standards. The post-Christmas re-cleaning involved further removal of the so-called musk glands and all the fatty deposits (see here – re-cleaned ‘rat above and pre-cleaned ‘rat below). Once re-cleaned they will be par-boiled in water and later re-cooked for the actual dinner (served in a sea of creamed corn next to a mountain of mashed potatoes). This year’s crop of muskrats were especially robust and fat. When these Napoleon ‘rats met their Waterloo they were well fed. We all agreed that one of the bodies looked more like that of a woodchuck than a ‘rat but it was processed anyway. Each carcass had to be probed and picked with proctolist-like precision. Under the shoulder blades, between the thigh muscles, inside the body cavity, along the back – there was no bodily space place un-examined by the cleaning crew. It is a labor of love. Jim was a first-timer at this and was placed right next to veteran ‘rat cleaner Ray Dushane in order to absorb all the fine points of the activity. Unfortunately this meant that all his ‘rats had to pass muster before being placed on the finished pile (see beginning picture – note extreme attention on his part). My daughter and I simply hid our products under the pile whenever we were tired of cleaning any particular carcass. Jim is now an expert but his hands still smell like muskrat fat. My real reason for bringing all this up, however, is the opportunity to explain how one can love something and kill it at the same time. It is a chance to illuminate a fine point of cultural identity. I will fail at both because I have consistently failed at this in the past. I have a book about muskrats floating around in my head. Once I get past the introduction the rest should flow – like a sink un-plugged by Draino or a toilet….never mind. The introduction remains my mental plug. Because the book would deal not only with the muskrat as an animal (life, ecological relationships and all that) but also with the muskrat as a cultural animal, there will be a lot of talk about dead muskrats. The identity of this creature is intimately tied with human culture. 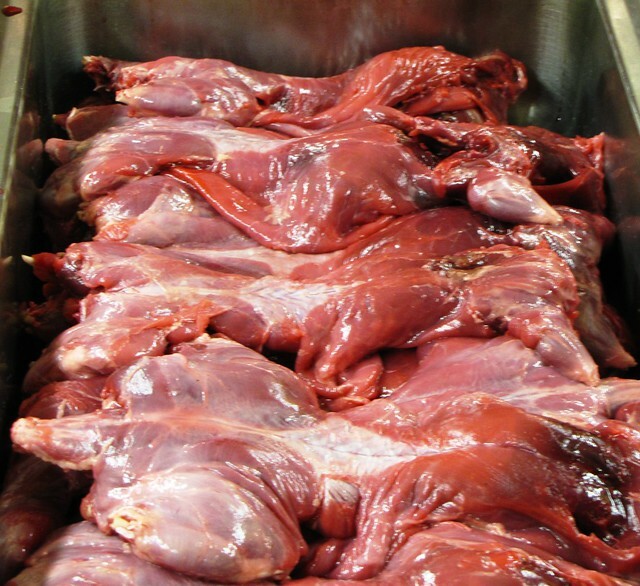 A majority of this connection concerns the pelt and the meat – which means that a majority of the muskrat/human interaction over the centuries involves live people and dead muskrats. Therefore, my job is to explain how one can literally love a creature to death and still love it in life. Unfortunately, even the spiritual type connection requires that the poor little ‘rat must die. 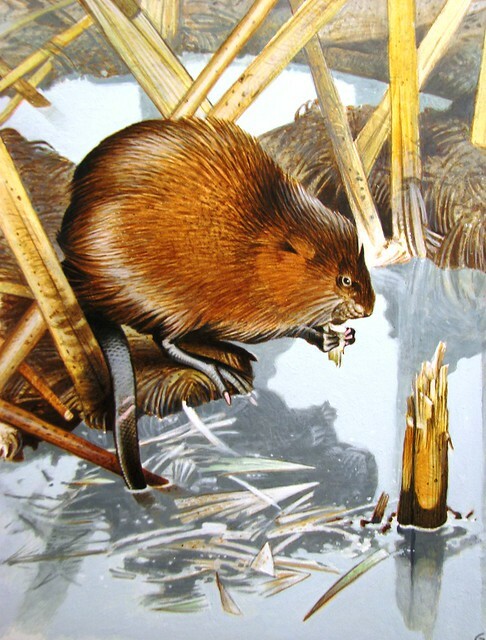 The muskrat saved the world in most versions of the Odawa Nanabozo tales but invariably dies in the attempt. About the only live muskrats in human culture are the little known Jerry Muskrat tales of Thornton Burgess and that insipid track recorded by the Captain and Tenille. Jerry and the Captain are not responsible for the special nature of the muskrat in the human world. To be perfectly frank, live muskrats tend to creep people out anyway simply because they are rodents (large mice) who live in marshes (mud) and have the word rat attached to their persona (confirming the presence of their naked tail). You should be able to perceive my problem by this point in time. I have used way too many words in the effort to reach the point at which I can state my case. In fact, the previous sentence even uses too many words (such as the multiple use of “point”). Let me just say it and be done. It’s time for the Draino to take effect, so to speak. Muskrat love is a regional phenomenon involving a distinct cultural identity revolving around a particular animal in a particular place. It is the cultural equivalent of one of those pin-point icons that show a location on a Google map. From the regional (S.E. Michigan) French-Canadian side of things, the muskrat provided both fur and food. Long after the beavers were gone, the muskrat provided. Because it was a water creature it could be eaten during Lent – saving many a starving Frenchmen during the War of 1812. 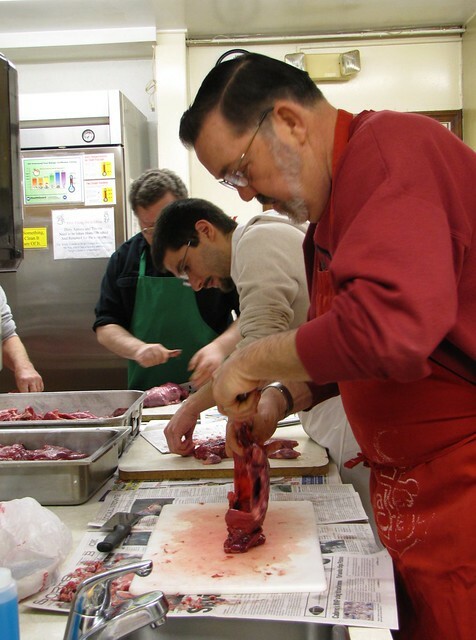 The preparation of the carcasses reached the level of priestly preparation for the High Mass involving certain “must-do” steps. 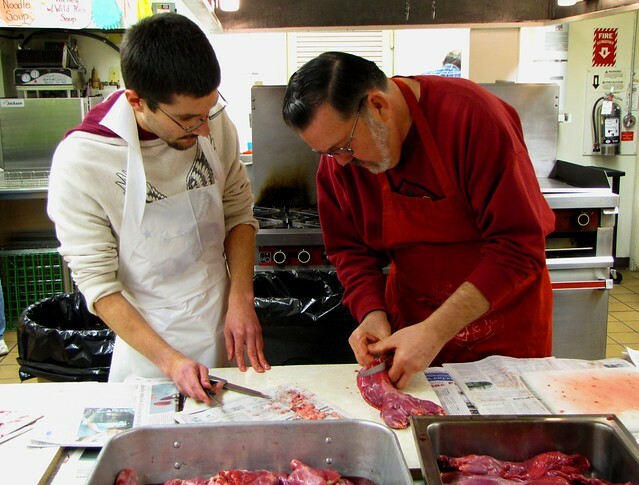 Secret family ‘rat recipes evolved and bridged the generations. So, you see, the loss of the muskrat would be as culturally damaging as the loss of buffalo to western tribes, salmon to the N.W Natives or Crawdaddies to Louisianans. It would not be fatal but would result in the fraying of regional cultural fabric. That is why we will never allow the muskrat to vanish and why we love the creature. Wow, that was heavy, eh? Just one more thing, just in case you are still holding out on this dead ‘rat thing. Muskrats reproduce like rabbits. It is near impossible to eliminate them and they will always have a place to die as long as a Frenchman has anything to say about it. They – that is the species – will be dancing on our graves long after we are gone. You are now ready to view this picture. Happy New Year. Although I am primarily a muskrat man (as confirmed in my previous post on the MDL) I must admit to more than a grudging respect for beavers. In fact, as long as we are confessing here, I have spent an inordinate amount of time seeking out the opportunity to observe these large rodents in the wild. The chances have been few and far between. Even in the North Country I have been provided with sustained views of their handiwork, such as dams, lodges, or felled trees, but only glimpses of the creatures themselves. They are primarily nocturnal and this made things even more difficult. Incredibly, my golden opportunity presented itself in a very regional manner. 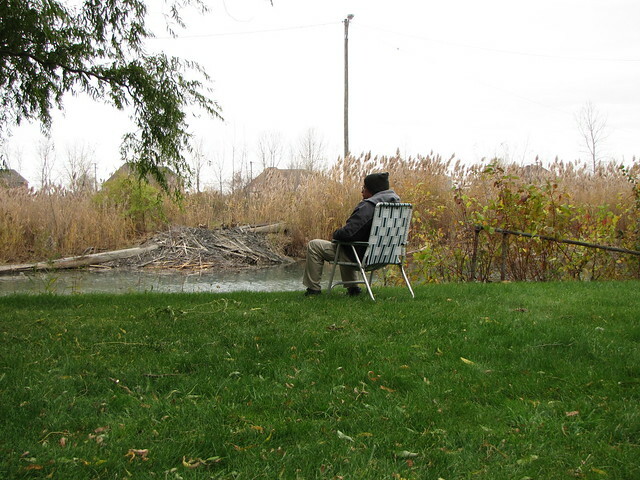 It turns out that one of the most observable beaver colonies in the state is located in urban Detroit. No, this is not a joke. The colony is located at DTE’s Conners Creek Power Plant on the Detroit River just opposite the north tip of Belle Isle. 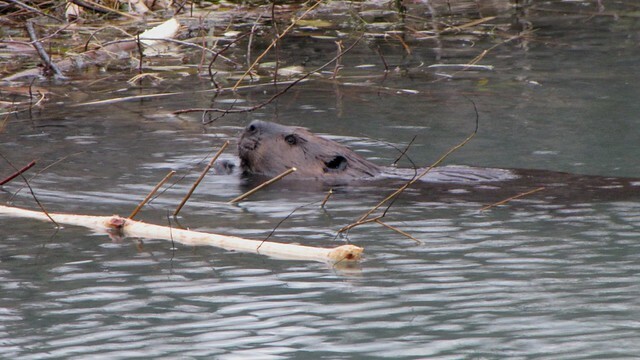 You might recall a news story from a few years ago that a beaver was spotted on the plant property. A trail cam video captured by DTE wildlife Coordinator Jason Cousino in 2008 confirmed the tale that not only did two of the flat-tailed beasts show up but that they were raising kids! At least two young were shown reaching for some cottonwood boughs placed before the trail cam in 2009. 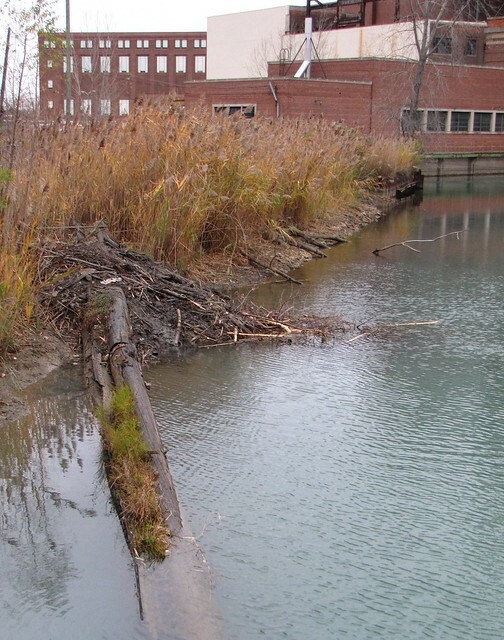 The press releases trumpeted the “Return of the Beavers to the Detroit River” and cited a mystery figure of 75 years as the last time these creatures were seen in the region. Perhaps biologists were looking at records from the Canadian side of the Strait, because in terms of the Detroit side that figure should be well over 100 years and probably much longer. As a center of the fur trade, Detroit was “ground zero” for local representatives of the Castor clan. Some 200 years ago this location was prime Castorland. Bela Hubbard, the early Michigan surveyor, once wrote that much of the pre-settlement landscape of Wayne County – and by inference, the adjoining counties – was actually created by beaver activity (dams, ponds, meadows, etc.). In case you are wondering, he is no relation to Bela Lugosi nor is he responsible for naming Big Beaver Road (that was an early settler thing based on a lodge near the road). The Conners Creek Power Plant was built between 1915 & 1921 (originally known as the Seven Sisters Plant due to the line of seven stacks that once adorned the building). Placed on the marshy ground where the creek entered the river, this plant loomed over the landscape for 90 years without casting a shadow on any member of the Castor clan. The entire Michigan side of the shoreline south of that point was developed, filled, industrialized, and basically beaver un-friendly. But, over time the immediate area opened up as surrounding buildings were razed and the place slowly took on the substance of a proper beaver habitat. The appearance, however, remained urban. When that wild beaver colony showed up, they completed yet another grand cycle of life. My introduction to this colony occurred this past summer when I was asked to give a presentation for the Kid’s Day at the Edison Boat Club. This club just happens to be located on the canal leading to the Conners Creek Plant and they promised to show me the beaver lodge. Not only did I see that the lodge was within touching distance from the club property, (the spot was even equipped with a chair!) but they were open to allowing me to return for some further study. I did pull a Douglas (as in Macarther) and returned. My experience was, to say the least, memorable. I offer you the accompanying photos as a teaser(wait ’til you see the video). This will not be my typical Naturespeak blog in that it will be on-topic. My motives are, well, less than noble. I wanted to show my readers that I am occasionally right. My self-serving topic is a simple one. Harvard can be wrong on occasion. Words are wonderful things but because it takes a thousand of them to describe a picture, I often resort to pictures in order to save the alphabet. I was searching the web for some word-saving pictures the other day – looking at the Google image page to find them. I was seeking old illustrations of beavers and beaver colonies. Some of the early woodcuts that came out during the fur trade era were done by European artists that had never actually seen one of these North American animals before. There were beavers in the Old World, but the artists that illustrated these travel accounts were forced to rely purely on fanciful descriptions. Their pictures certainly reflect that and they can be quite amusing by current-day standards. The 1738 account of Claude LeBeau contains a woodcut showing a colony of industrious beavers which look more like Naked Mole Rats with flat tails. There are dozens of animals working together. In one corner of the picture 6 beavers are shown chewing away at a single tree. The dam in the background is topped with an upright fence. There are no beavers shown painting that fence but the image definitely hints that they probably did so every Wednesday after the groupsing. I was just looking through your Harvard Art Museum Website and noticed a mislabeled illustration. Since it doesn’t appear that the piece was originally labeled by the artist, I assume that this is probably a cataloging error made at an early stage – possibly during initial acquisition (in the 1920s?). You might want to consider changing the label for the sake of accuracy (in cases of on-line search engines etc.). The illustration I am referring to is the William Rowan drawing titled “Head, Paw, and Fur of Beaver”. 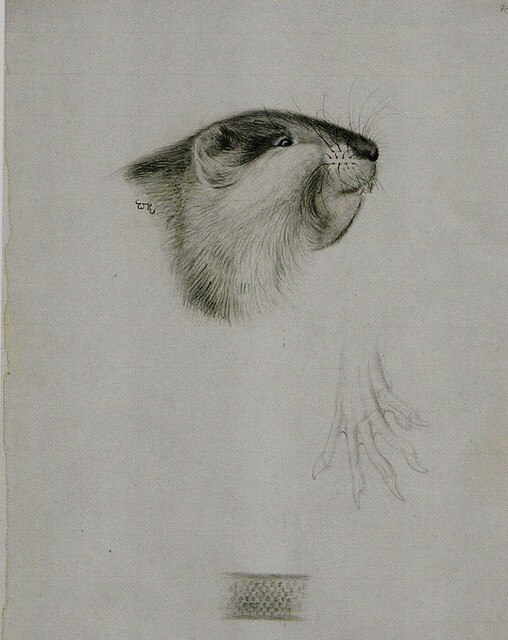 This sheet actually depicts a muskrat – detail of head, hind foot, and portion of tail. There is a world of difference between the muskrat and the beaver. 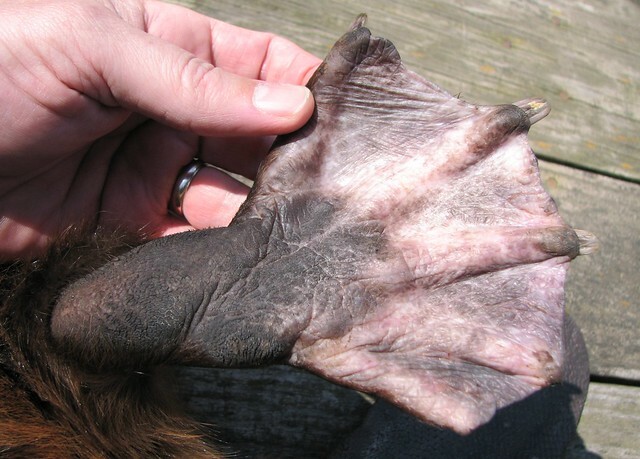 The hind foot on the beaver, for instance, is fully webbed whereas that same appendage on a muskrat is equipped with only a tiny portion of webbing. 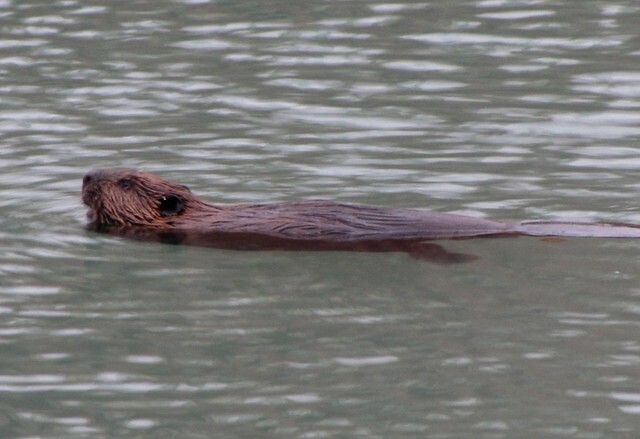 It also takes about ten hefty muskrats to equal the size of an average beaver. As a career naturalist my observation can be considered valid. Yes, I know this may not seem much of a distinction but the two creatures, although related, are as different as a house cat and a lion. Of course, the real reason for calling this to your attention is for the defense of the lowly muskrat. The beaver has always gotten the attention over the years while the muskrat’s recognition has been delegated to that cheesy “Captain and Tenille” song. I guess someone needs to be captain of the MDL (muskrat defense league)! I did not really expect an answer. The pencil drawing, by a Swiss immigrant to Canada named William Rowan. was executed in the early 1900s. It was not a major piece of work. I, however, felt proud of the chance to flex my Muskrat Defense League muscles. Thank you for your message. The title has been changed to reflect the correct species. Needless to say, I felt the need to forward this tidbit for two reasons: vanity and education. I’ve explained the vanity part, but ask that you examine this illustration closely. 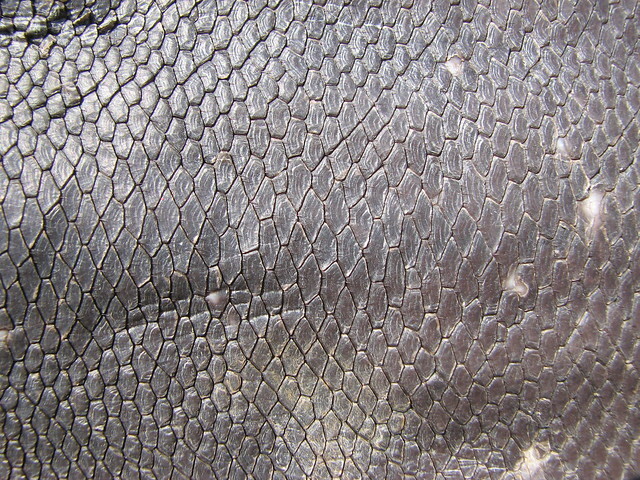 Examine the details and compare this with foot and tail details of a beaver (see below) and you too can become a member of the Muskrat Defense League.